‘Against the white sand, the contours of my father’s body were well defined, emphasizing its existence, an independent solid existence in a world where everything was liquid, where the blue of the sea melted into the blue of the sky with nothing between. This independent existence was to become the outer world, the world of my father, of land, country, religion, language, moral codes. It was to become the world around me. A world made of male bodies in which my female body lived.’ Nawal El Saadawi has been pilloried, censored, imprisoned and exiled for her refusal to accept the oppressions imposed on women by gender and class. For her, writing and action have been inseparable and this is reflected in some of the most evocative and disturbing novels ever written about Arab women. 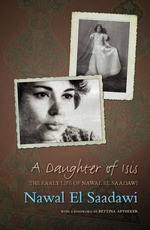 A Daughter of Isis is the autobiography of this extraordinary woman. In it she paints a sensuously textured portrait of the childhood that produced the freedom fighter. We see how she moulded her own creative power into a weapon – how, from an early age, the use of words became an act of rebellion against injustice.